Ok so this really isn't apple pie...but when you are wanting something that sure taste a lot like apple pie and the comfort memories that Apple pie brings...but without the calories, then here ya go!! With the launch of the 21 Day Fix extreme around the corner I decided to get back strict on the 21 Day Fix meal plan and get my containers back out again and really get my portions back in check. So it was time for my snack and I cut up a green apple...well it was quite tart so I decided to cook them and see how it turned out! They were amazing!!!! 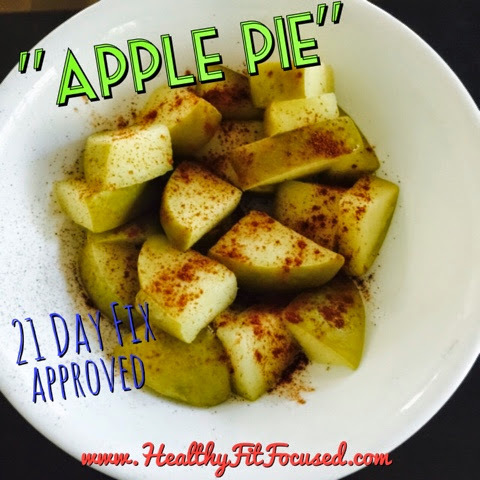 Sprinkled some cinnamon on it and there you go...21 Day Fix approved "Apple Pie" apples!! All you need is 1 green apple and cinnamon. This is equal to 1 purple container!! Cut one green apple into chunks. Place in a small sauce pan with about a tablespoon or so of water. Let it cook for about 3-5 minutes while stirring, or until desired softness. Pour into a bowl and sprinkle with cinnamon! Enjoy! !